Zhou, J.; Wang, S.-Q. ; Wei, J.-C.; Zhang, X.-M.; Gao, Z.-C.; Liu, K.; Ma, Z.-Y. ; Chen, P.-Y. ; Zhou, B. Mx Is Not Responsible for the Antiviral Activity of Interferon-α against Japanese Encephalitis Virus. Viruses 2017, 9, 5. Zhou J, Wang S-Q, Wei J-C, Zhang X-M, Gao Z-C, Liu K, Ma Z-Y, Chen P-Y, Zhou B. Mx Is Not Responsible for the Antiviral Activity of Interferon-α against Japanese Encephalitis Virus. Viruses. 2017; 9(1):5. Zhou, Jing; Wang, Shi-Qi; Wei, Jian-Chao; Zhang, Xiao-Min; Gao, Zhi-Can; Liu, Ke; Ma, Zhi-Yong; Chen, Pu-Yan; Zhou, Bin. 2017. 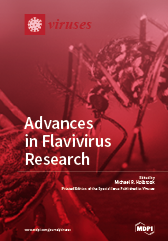 "Mx Is Not Responsible for the Antiviral Activity of Interferon-α against Japanese Encephalitis Virus." Viruses 9, no. 1: 5.